Tigerair Australia is taking a cautious approach to expansion as it focuses on trying to complete a turnaround. Prior promises to expand the fleet to at least 23 aircraft by 2018 are unlikely to be fulfilled; instead most or all of its remaining A320 orders could be deferred and converted into A320neos. Tigerair Australia has made considerable progress since Virgin Australia took over a 60% stake in Jul-2013. But the LCC is still highly unprofitable and does not want to expand domestically or enter the international market until its position has improved. The cautious approach to expansion is sensible given current market conditions in Australia. But it would come at the expense of pursuing strategic opportunities, including a potential tie-up with Singapore Airlines long-haul LCC Scoot. Tigerair Australia launched operations in 2007 and currently operates a fleet of 13 A320s to 12 domestic destinations. The airline has been steadily unprofitable and again incurred a large loss in the fiscal year ending 30-Jun-2014 – which marked its first year under Virgin Australia Holdings. Virgin Australia completed in early Jul-2013 the purchase of a 60% stake in Tigerair Australia from Singapore-listed Tiger Airways Holdings. In Virgin Australia’s FY2014 results the group recorded a loss of AUD46 million (USD42 million) related to its share of Tigerair Australia. That equates to a loss for Tigerair Australia of AUD77 million (USD71 million) in the year ending 30-Jun-2014. Based on earlier financial reports from Tiger Airways Holdings, Tigerair Australia’s loss was SGD35 million (USD27 million) for the quarter ending 30-Jun-2014; SGD14 million (USD 11 million) for the quarter ending 31-Mar-2014; SGD19 million (USD15 million) for the quarter ending 31-Dec-2013; and SGD18 million (USD15 million) for the quarter ending 30-Sep-2013. That also adds up to a loss of about USD70 for the year ending 30-Jun-2014, with the biggest loss occurring in the most recent quarter. Majority shareholder Virgin Australia only reports results every half year and has a different fiscal year from Tiger Airways Holdings. The losses are clearly unsustainable. Revenue and yield figures are not available but Virgin reported that Tigerair Australia transported 3.3 million passengers in FY2014, an increase of 15% compared to FY2013 as two A320s were added. As a result Tigerair Australia lost an average of more than USD20 per passenger in FY2014. The carrier’s financial situation has not improved since Virgin Australia acquired the majority stake. In the last 15 months under full ownership of Tiger Holdings – Apr-2012 through Jun-2013 – Tigerair Australia incurred losses of SGD86 million (USD69 million). Tigerair Australia transported 3.2 million passengers during this 15 month period, amounting to a similar loss of slightly more than USD20 per passenger. Tigerair Australia’s figures were even uglier in the fiscal year ending 31-Mar-2012, with a SGD77 million (USD61 million) loss and only 1.6 million passengers carried. But this result was impacted by the five-week grounding in CY3Q2011 by Australia’s regulator, which also required a slow build up in flights after the airline resumed operations. The continued losses over the last year are discouraging, particularly the loss in the most recent quarter as it was Tigerair Australia’s largest loss in the last couple of years. But the losses over the last year are more than anything else a reflection of the challenging conditions in the Australia domestic market, which has been suffering from overcapacity and relatively weak demand. Although the results do not show it Tigerair Australia has made several improvements since it was brought under the Virgin Australia umbrella. These should start to result in improvements to Tigerair Australia’s bottom line in FY2015, particularly as it seems market conditions are starting to become more favourable with a return to more rational competition and a slightly better demand environment. For example Tigerair Australia has reported progress in its initiatives implemented since the transition to Virgin Australia Holdings to improve customer satisfaction and revenues management. The airline also has taken several steps to improve its network and develop a more efficient operating platform. Virgin Australia is confident that based on the achievements in the first year of the Tigerair Australia transformation programme that the LCC is on a path to finally achieving profitability by FY2017. Network adjustments which were implemented in 2HFY2014 and at the beginning of FY2015 should help Tigerair Australia improve its financial position in the new fiscal year. For example Tigerair Australia opened in Mar-2014 a new Brisbane base, which now includes two of the carrier’s 13 A320s. Tigerair now operates 60 weekly flights from Brisbane on five domestic routes. Brisbane has become Tigerair Australia’s third largest operation after Melbourne and Sydney, where the carrier bases seven A320s and four A320s respectively. 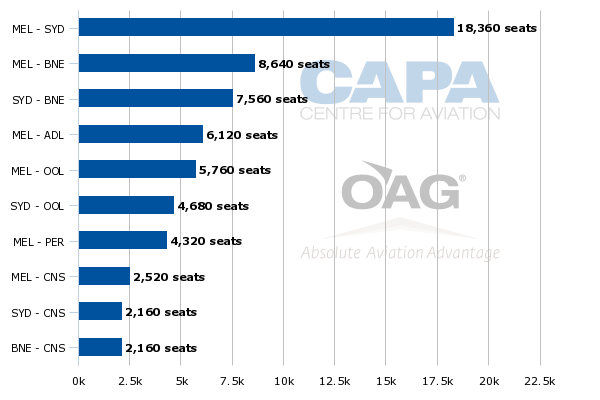 At Brisbane, Tigerair Australia currently has a 5% share of domestic seat capacity and a 25% share of LCC capacity, according to CAPA and OAG data. This matches Tigerair’s approximately 5% share of the total Australian domestic market but is above the 20% share Tigerair has in the LCC sector compared to 80% for Jetstar. 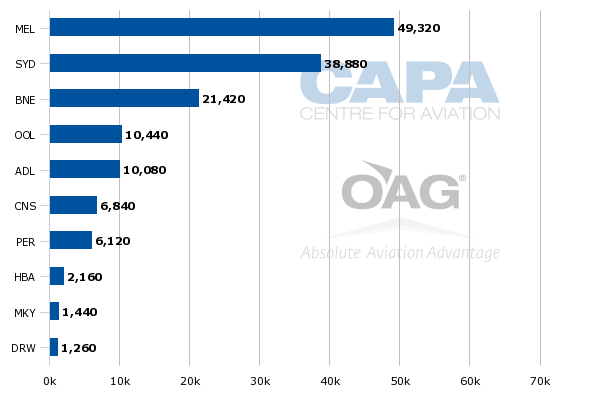 LCCs currently account for only 19% of domestic capacity in Brisbane compared to 25% nationwide. Tigerair also added capacity in Jul-2014 at nearby Gold Coast, which is now the carrier’s fourth largest destination overall and largest destination that is not a base. Gold Coast is currently served with 29 weekly flights, including 16 from Melbourne and 13 from Sydney. Melbourne-Gold Coast and Sydney-Gold Coast have become Tigerair Australia’s fifth and sixth largest routes. Melbourne-Sydney is the largest, with 51 weekly return flights, followed by Melbourne-Brisbane, Sydney-Brisbane and Melbourne-Adelaide. Mr Sharp said that Gold Coast was expanded by redeploying capacity from Alice Springs, which Tigerair dropped from its network on 22-Jul-2014. Tigerair was the only LCC (and the only carrier other than Qantas) at Alice Springs, which it served from Melbourne and Sydney. But after 18 months in Alice and meeting an initial commitment to the community, where it received marketing support, Tigerair Australia determined the market was too small to stimulate sufficient demand on a year-round basis. Gold Coast represented a better option for the capacity with stronger and more consistent leisure demand. Such network decisions can be difficult to make but are necessary as the airline tries to turn around. Mr Sharp said Tigerair Australia has been focusing in recent months on improving its yield and investing in revenue management initiatives. He said that over the last year there also have been initiatives on the cost side to leverage Tigerair Australia’s relationships with both Virgin Australia and Tiger Airways Holdings. Most new interactions and joint purchasing activities have come with the Virgin Australia side. But some key contracts are still combined with Tigerair Singapore, including for the website and reservation system. Tigerair Australia also has approached some areas independently using its own team, including revenue management. Mr Sharp also told CAPA there are signs of improving consumer demand. Since the beginning of FY2015 more Australians have been visiting the Tigerair website and looking at fares. Mr Sharp sees these as “green shoots” pointing to improved consumer sentiment. Consumer sentiment in Australia has been relatively weak over the last year, impacting Tigerair Australia as it is predominantly a leisure carrier. While Tigerair Australia is continuing to look at opportunities for new routes in coordination with the network team at Virgin Australia Mr Sharp pointed out that the LCC will not add any capacity until the market is ready. The focus for now is still on improving unit revenues and turning around the airline rather than growth. Tigerair Australia does not believe it is a sensible strategy to add an aircraft unless there is a market to profitably deploy the aircraft. As a result Tigerair Australia has not yet committed to any expansion in FY2015. The Virgin Australia Holdings earnings report for FY2014 also mentioned no fleet expansion for Tigerair in FY2015 but detailed modest fleet expansion as well as replacements for other subsidiaries. Tigerair Australia currently has six more A320s on order, according to the CAPA Fleet Database. One of these aircraft flew for the first time in Toulouse in late May-2014 but is still at the Airbus factory, leading to some uncertainty over its status. Tigerair Australia and its two shareholders have not provided any information on potential additional deliveries. But it is clear the airline is generally not keen to expand while it focuses on completing its turnaround programme. In Mar-2014 Tiger Airways Holdings cancelled the remaining nine A320ceos in its order book and at the same time placed orders for 37 A320neos, which the group will take from 2018 and will be mainly be used to replace A320ceos now operated at Tigerair Singapore. Tigerair Australia could make a similar move within the next few months, cancelling some or all of its remaining A320ceo orders as part of an order for A320neos. Tigerair Australia was not part of the Tiger Airways Holdings deal from Mar-2014 as it is now only 40% owned by the Singapore-based group. Previously Tigerair Australia sourced all its aircraft from Tiger Airways Holdings. But when the sale of the 60% stake was completed to Virgin Australia, a portion of the Tiger Airways Holdings order (eight aircraft, including the two which were delivered in FY2014) with Airbus was transferred to Tigerair Australia. As a result the subsequent deal between Tiger Airways Holdings and Airbus did not include Tigerair Australia. Tiger Australia has been looking at potential fleet options. As replacements for its existing 13 aircraft will eventually be needed it would be logical to order A320neos and potentially use the new deal to cancel some or all of its A320ceo orders. This would give Tigerair Australia time to complete its turnaround plan and resume growth in a few years with the added advantage of a more efficient aircraft. Virgin Australia and Tiger Airways Holdings would both have to first agree on any changes to the Tigerair Australia fleet plan. While Virgin Australia owns a majority stake in Tigerair Australia the agreement between the two companies is classified as a joint venture, requiring unanimity on key issues including business plans, major contracts, capital expenditures and aircraft delivery schedules. Securing approval on a new Airbus deal from Tiger Airways Holdings should not be an issue as the company forged a similar deal with Airbus earlier this year. Virgin Australia however could be keen to look at other options including having Tigerair Australia join its full service subsidiary in operating 737 MAX 8 aircraft, which Virgin has already ordered. This would complicate matters as Tigerair Australia would lose synergies with other Tigerair affiliates (but gain synergies with Virgin Australia) and would give the airline less leverage in potentially cancelling or deferring its remaining A320 orders. Tigerair Australia clearly faces some important decisions in the coming months on its long term fleet. But regardless of which route it goes it has become increasingly clear that the airline will not meet its initial pledge to expand. When initially agreeing to the equity transaction and seeking anti-trust approval, Tiger Airways Holdings and Virgin Australia Holdings said they would increase Tigerair Australia’s fleet to 23 aircraft by 31-Mar-2018. They also signalled the potential of growing to fleet to 35 aircraft. This commitment it turns out was not a guarantee. Given the recent losses and challenging market conditions expansion is not a commercially sensible option. It is no longer likely that Tigerair Australia’s will expand by more than a few aircraft over the next three years, which would leave it several aircraft behind the 23-aircraft level. The only realistic scenario for Tigerair if it were to add 10 aircraft over the next three and a half years would be international expansion. There could be opportunities for Virgin Australia to transfer unprofitable narrowbody international routes to its LCC subsidiary as well as for Tigerair Australia to enter some new leisure focused international markets. Tigerair Australia also has shown no apparent interest during its current phase of working with potential partners. Scoot is particularly interested in domestic connections as it looks to build up its network model. Scoot now serves three destinations in Australia – Gold Coast, Perth and Sydey – all of which are served domestically by Tigerair Australia. In Thailand, Scoot recently began interlining with Thai LCC Nok Air and is now working on implementing an expanded partnership with Tigerair Singapore which was recently approved by Singapore competition authorities. Given the continued large losses at Tigerair Australia it is hard to criticise the airline for focusing on improving its performance in the domestic point to point market. If Tigerair Australia cannot fix its longstanding issues and finally carve out a sustainable niche in the highly competitive Australian domestic market there is little point expanding into the international market. Domestic expansion at this point would almost certainly be profitless for Tigerair Australia. But there is also a strategic battle going on in the Australian market and Tigerair Australia is now one part of group actiivities - attached both to the Singapore Airlines group (including Tigerair Singapore and Scoot) and to the Virgin Australia group. There are undoubted synergies yet to be developed that benefit each group, where losses in one part can generate both financial and strategic group gains that outweigh those losses. That is not territory that CFOs like to venture into, preferring a tidy bottom line. But for group CEOs, the scenery can look quite different. And it's with them that the buck stops.